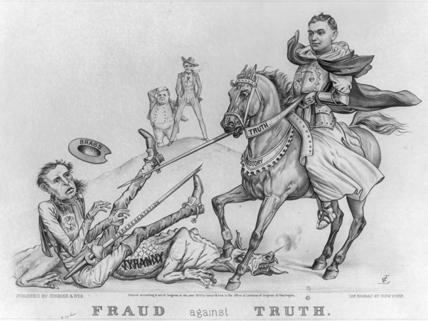 This 19th-century cartoon shows truth winning over fraud. However, throughout U.S. history, fraudsters, tricksters, charlatans, scammers, and con artists have often enjoyed great success—at least for a while. A recent incident involved a scathing report on conditions at Chinese factories where popular electronics are made for the US market. The reporter made some of it up, though. He claimed he had to embellish the facts so that the truth about terrible factory conditions would get more publicity. Other American scammers have had less noble goals. During the settling of the West, land scams were common. Unscrupulous agents sold plots to people back East or even in other countries, on the promise of an established, bustling town. When the buyers arrived, they often found nothing but dirt and tumbleweeds. One of the boldest con men in the early 20th century was George C. Parker, whose specialty was selling New York’s monuments, which, of course, he did not own. Among the monuments he “sold” were the Statue of Liberty, Madison Square Garden, and the Metropolitan Museum of Art. Parker sold the Brooklyn Bridge twice a week for years. Often “buyers” would set up barriers on the bridge so they could collect tolls from travelers, only to be told by police of their folly. Another scammer, Charles Ponzi, became a millionaire by paying early investors with the cash of later investors. He took a cut, of course. In 1920, Ponzi’s scheme crashed, leaving his investors $225 million poorer (in 2011 dollars). Ponzi’s name lives on as the term for any scheme that pays investors not with genuine dividends, but with the money of later investors. More recently, Americans have been duped by Billie Sol Estes, Bernie Cornfeld, Clifford Irving, Frank Abagnale, Kenneth Lay, and many others. Probably the most infamous is Bernard Madoff, who cost his investors billions of dollars. He had run the biggest Ponzi scheme in history. Watch the interview that revealed the Mike Daisey controversy. This list organizes the perpetrators of fraud by the century when each was active. Read about scammers who specialized in literary fakes. Read this page and follow the links to keep from being a con artist’s April Fool.